Once again it is time for the quarterly bloggy giveaway from BloggGiveaways.com running the week of January 26. I have joined several of the giveaways and had a great time meeting a lot of new people and finding fabulous new blogs to read. Welcome to everyone visiting, please take a moment to look around and come back again to get to know my little bloggy part of the world. I love meeting new people and especially enjoy comments! This time around I am giving away some items that will be great to help you relax after exercising or a long day. A two pack of Homedics mini massagers, plus a $5.00 Target gift card. The mini massagers are absolutely amazing if you have never tried them. 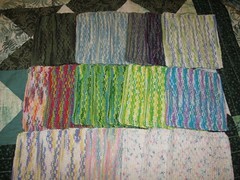 They help to ease muscle tension after a work out, are fabulous to take on vacation, or even to pack in a birthing bag. If the comments break the mark from last time, I will toss in something else for the winner. 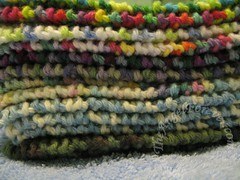 I will give them their choice of some of the knitted washcloths that I have made. The winner will be able to select the colors they would like. Here are some examples below. I will open up this giveaway to anyone in the United States and Canada. To enter, just answer this in the comment section –> Tell me one healthy snack that you must have (this must be included or your entry will not count). Be sure that I have an e-mail address that I can contact you for mailing address after the giveaway is over. I will use random.org to generate a winner from the comments. This giveaway closes at 10:00 pm EST on Sunday, February 1. MAIN RULE – Leave a comment telling me at least one of your favorite must have healthy snacks. 1 Bonus Entry – Stumble my main blog page. Again, thanks for stopping by TheAngelForever. If you are new here, please feel free to bookmark my blog or add me to your feed reader. Best of luck and happy giveaway hunting! Update: Thanks to everyone for entering the giveaway. A winner has been selected and will be notified today (2/2) and then announced. My fave healthy snack is celery. I heard once you actually burn more calories digesting it than it has in it. I’ve been in love ever since. My must have healthy snack is Lara Bars (cashew cookie is my fave!). I found a recipe online, but haven’t made them yet since we’ve been packed to move for quite awhile. I also keep honey crip apples around. yum! I’d really love your washclothes, even more than what you’re giving away. Love cherry tomatoes for a snack. Carrots and low fat ranch dressing. YUM! My favorite healthy snacks are veggies and fruit. At our house we like carrot sticks, walnuts, and homemade banana muffins. I love bananas! They are a great healthy snack. Thanks! Grapes and cheese. Homemade oatmeal cookies also take down cholesterol and taste great with raisins. Woah, so many choices, its really hard to choose! Probably the Dark Chococate Brownies. I like almonds and apples! I like to snack on apples. I LOVE Granny Smith apples! i love fuji apples slices baked with cinnamon! My favorite healthy snack is yogurt. My favorite snack is apples! Honeycrisp apples are especially good! Sweet and crunchy. I like other varieties too, though! Fresh are best, but dried apples are also wonderful for on the go – much less sticky! I must have baby carrots! They are so convenient to carry around and I love them! I love light popcorn, great nighttime snack! My favorite healthy snack is….don’t laugh…dried prunes. I have a bag on my desk at work and pop one in my mouth any time I have a sweet craving. I promoted your giveaway on Luck Happens: http://www.luck-happens.com/february-2.html. Entry #2: I promoted your giveaway on Luck Happens: http://www.luck-happens.com/february-2.html. Entry #3: I promoted your giveaway on Luck Happens: http://www.luck-happens.com/february-2.html. Popcorn, popcorn. I love it and rice crackers that are flavored with cheddar cheese. Thanks for having the wonderful giveaway.